What are the different types of Rice farming? paddyfields in temperate northeast Asia (approaching 40 degrees of latitude) to metres deep water in tropical river deltas; it is cultivated from sea-level to more than 2000 metres in parts of the Himalayas (in Nepal and Yunnan). Across this ecological and geographical variation rice has a wide range of local ecologies. One of the key aspects of variation is how wet the conditions are in which rice is grown from dry rainfed rice (which still requires at least 800 mm of rainfall) to wet and flooded conditions. The image below illustrates the spectrum from drier to wetter rice cultivation systems. Dry to Rain-fed - water levels fluctuates according to season and growing period. can be subdivided into upland and lowland rainfed rice. About 13% of rice is upland type. Decrue agriculture, of flooded rice is grown in the shallow water of wet season flooding. The practice is especially prominent in West African rice production on the Niger River but similar systems are found in Asia and were probably once more widespread. Irrigated - fully controlled floodwater is kept shallow. This is what we asscociate with typical "paddy" fields. Some rice grown at higher elevations well-maintained terraces can be classed as this type. How does flooding produce Methane? Rice has developed aerenchyma tissue which allows methane to escape the soil through the plant structure. This is a hollow series of tube-like structures within the plant that transport air bubbles through the rice plant. It is therefore important to look at social practices before relying on the methane level to reconstruct rice agriculture in prehistory. The analysis of modern analogue systems allows us to apply these techniques to the archaeological record in a comparative manner. Most commonly microscopic one celled algae organisms encased in a silica shell which allows them to be preserved in the archaeological record usually layered within seabeds or other strata to form part of the record for geological activity and environment in prehistory. Microscopic silica body within a plant's structure that archaeologists can use to reconstruct plant profiles. The inorganic remains survive in the archaeological record and are diagnostic to plants, and parts of plants. Phytoliths are prepared from plant remains that have been charred to leave the phytolith isolated for analysis. This can also be done through chemically dissolving the surrounding soil, or by bleaching. Seeds will inform archaeologists about what plants were present at a site and in what quantity. 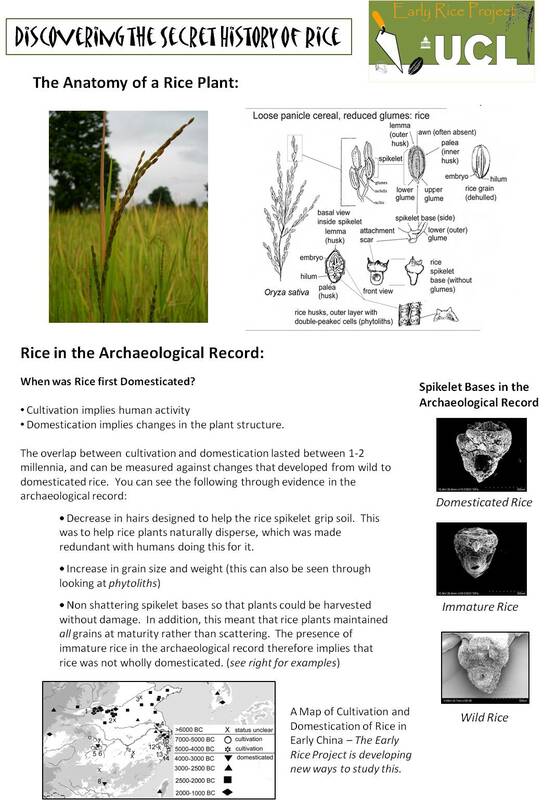 This is a comparative analysis that will demonstrate the prevalence of rice at archaeological sites, and what weeds were present. An assemblage is the larger context of the archaeological record. Diatoms, phytoliths and seeds are the micro-remains which are individual components which make up the larger site, such as a padi field or terrace, which is known in the archaeological record as an 'assemblage'. Indica vs. Japonica - these two variations of the rice plant were domesticated through distinct events. Decrease in hairs designed to help the rice spikelet grip soil. This was to help rice plants naturally disperse, which was made redundant with humans doing this for it. Non shattering spikelet base so that plants could be harvested without damage. In addition, this meant that rice plants maintained all grains at maturity rather than scattering.